« The Step UP! Knapsack! Keeping it Simple with Step UP! Right from the start of Step UP! we have said that Step UP! Day will be November the 5th, and that to support Step UP! 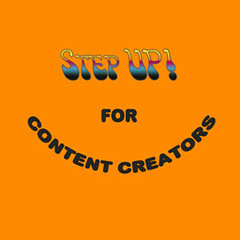 on that day no-one uploads anything to the grid, that people wear the Step UP! ribbon to show support, and that they hold or attend Step UP! parties to celebrate content creation. Those are still our objectives. We are NOT calling for a boycott of selling or buying – and we hope that people will continue to blog, plurk and twitter to let everyone know that it’s Step UP! Day! There has been some confusion as another group, Artists’ Voice, IS calling for a 48 Hour boycott of uploads, selling, buying and blog posts – and several blogs and chats have confused the two campaigns. We are delighted that there is such interest in opposing content theft, and we wish them well with their planned protest. But we are not asking people supporting Step UP! to do anything more than we originally asked. The objectives of Step UP! remain the same.